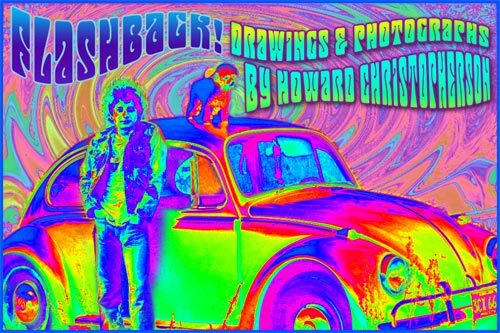 ICEBOX GALLERY presents: Flash Back! Drawings and photographs from 1973 to 1988 by Howard M. Christopherson. The art in the exhibit dates back to when I was in high school. My art teacher at the time gave me the nickname "Stranger than Fiction" because of the subject matters and ideas portrayed in my drawings. It was there that I started my creative journey. My dad, Howard Sr., was a WWII Purple Heart Veteran and a skilled welder by trade. His love, however, was woodworking, hunting and fishing. It was his framed drawing of two horses running at night in a thunderstorm that was my first personal inspiration to make art. My mother Lorina came from a big Catholic family and worked hard at a country club, a laundry, and Honeywell where she assembled torpedoes. Neither of my parents ventured on to receive high school educations before they began to work. Of the four kids that they had, I am the youngest. In 11th grade I spent half of the school day at the new Eden Prairie Vocational - Technical School studying graphic arts, photography, film and video production. I made several 8mm films, using animation or featuring my own friends as the actors. This exposure to myriad forms of expression opened my eyes to b/w darkroom printing for the first time. The work program and my employment in the audiovisual department for Edina Public Schools in 12th grade gave me additional opportunities; to make vacuum form maps, to copy slides and to clean, splice and library the 16mm films shown in the classrooms. Additionally, I was enrolled in my high schools studio arts program; it was an independent study program allowing me to make my art at home, at night, and away from the classroom. My earliest drawings and photographic images included in this exhibit are from 1973 when I was in 12th grade. Transcending out of high school, I was filled with imagination and an intense interest in art, photography, film, travel and nature. My ambitions included teaching myself how to draw my free flowing thoughts, making sculptures, creating short films and making photographs of what I saw. When I drew, sometimes I would simply lie out a piece of paper and begin. Other times I would stare into the white opening of a blank sheet until I could visualize the drawing, and then I went about tracing the vision I was projecting from my mind. The drawings would form from my thoughts at that moment. I would intentionally discipline myself from drawing the same image twice. I thought that it would be a waste of time when I could draw something new. My friends would stop by to visit me and I would put on a record and carry on a conversation, all the while drawing. If I did not make art for more than a few days, I would create twice as much the next week. I felt that I needed to make art and improve my skills. I would and still do become incredibly uncomfortable if I suppressed the need I feel to make art. Usually my drawings would take anywhere from days to several months to complete. Sometimes I would draw continuously for more than 20 hours at once. A wide variety of subjects showed up in my drawings; outer space, war, love, religion, and politics mixed like a maelstrom of free flowing thoughts and emotions. In the beginning my pen and ink drawings were made with the (recently invented) felt tip pen. However, later I used the more technically precise and extra fine mechanical pen, which soon became my primary drawing tool. I soon added color pencil and ink wash to the mix. Exploration continued with many forms of art supplies and found media. Music was like life-blood to my friends and to me. I played the drums in garage bands growing up and my friends had powerful stereo component systems. We liked our music loud. A new album of rock and roll under your arm then is what bringing home a bottle of scotch is to me today: A real treat! We filled the late 60s and 70s with rock concerts, often standing at the front of the line for tickets and sitting in the front row for the show. Lots of teenagers growing up in the 60s and 70s felt twisted by internal forces: the war in Vietnam, the fear of being drafted, the civil rights movement. At the same time we were twisting our thoughts further with chemicals. I craved adventure, but I lived in the suburbs, so I had to make my own adventures. It was a time when many young people read Carlos Castaneda and the Lord of the Rings and dabbled in Eastern thinking. The Watergate scandal was on TV every day, which eventually led to Richard Nixons resignation. This was the time when I decided to cash out my 1967 El Camino automobile, buy a new 35mm camera and lots of Kodachrome film, and stick out my thumb in order to hitch hike in search of America and myself. I loved my new Canon Ftb camera and the quality 35mm images that it produced. I took photographs of landscapes, flowers, animals, people and nature. When I first bought the camera, I spent some time indoors assembling found objects into still life creations that I would photograph using Kodachrome slide film. These photographic images often took on a mysterious and surrealistic appearance apparent in my drawings from this time. Some photographs even include drawings because I constructed the still life on my drawing table. In 1975 I hitch hiked around several Southwest and Western states with a friend. I saw and photographed mountains, the desert, Mexico and the Pacific Ocean for the first time. It seemed like everyone smoked pot back then. All kinds of drugstore and mind-blowing pills (little uniquely fashioned gelatin hits, such as green pyramid and microdot, made by the people who made the acid pills), blotter paper, coke and hashish floated around. I am lucky; I survived this period. However, before it was over I lost two friends: Bob fell asleep in his car after doing several strong barbiturates on a very cold winter night and never woke up; another long time friend named Scott fought undiagnosed depression until one day he hung himself from a tree down by the Walker Art Center. After graduating from high school, I considered both enlisting in the Navy and enrolling in the Minneapolis College of Art & Design in the fall of 1975. Instead I choose to get married and move to Monterey, California. I told myself that I would learn art through personal experience, and to follow through, I gave myself assignments such as life drawing, story  board making, creating 8mm films, exploring abstraction, dabbling in photojournalism and drawing surrealistic images. I collected art books and took horticulture and art history classes while I practiced my drawing and photography. I had my first gallery showing of drawings in Monterey. I lived in California from 1976 to 1979 and was very inspired by the sea and landscape of the area. 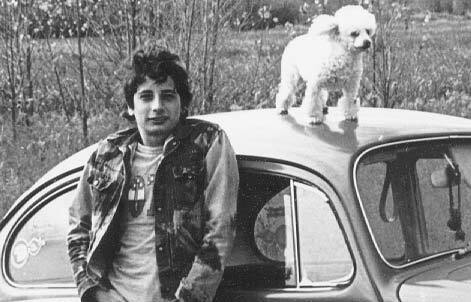 I moved back to Minneapolis in January 1979, broken hearted and soon-to-be divorced. I relied on my art and my desire to travel for strength and purpose while I recovered. I continued to travel. I toured England, Scotland, and Paris and made several trips to Mexicos Yucatan Peninsula. In 1983 I traveled alone to the Galapagos Islands, Ecuador, Peru and Bolivia. In1984 I visited New York City for the first time and learned about its art scene. My camera became a constant companion throughout my adult life. In 1988 I began my gallery and framing business I call Icebox. As the business grew and we expanded, we moved to this location in the Northrup King Building. During the move of Icebox in June of 2003, I discovered several portfolios of drawing and slides that I had not seen in years. From this unearthing I assembled this show, exhibiting the work for the first time. I view this show not as a retrospective look into a different period of my life, but instead as a sampling of art that I made over an important and explorative time that I want to display and share. This show was possible because of my recently acquired digital scanner and archival inkjet printer. This technology enabled me to print the color images myself from my original slides. The photographic images included have only been 35 mm Kodachrome slides until now. In 1985, after nearly three years, I completed my most ambitious independent film titled "Night Dance". This project is made of animated hand colored still photographs. Each of the 940 images that make up the 29-minute film were hand colored using ink dyes and other methods of manipulation. The finished work is a video that was created using six slide projectors and two dissolve units to sequence all 940 35mm slides. "Night Dance" has an original soundtrack composed by William Hohn. The video could be described as a romantic tragedy and features four main characters that dance through indoor and outdoor scenes. Photographed in Minneapolis and the surrounding suburbs, the images are brightly colored and melt into each other, creating a dreamlike affect. It is rare to see my drawings and photographs combined into one work of art. "Night Dance" will be shown twice on Thursday, September 2nd. Admission free. Over the years my drawing, film and sculpture interests have slowly tapered off, and in their place my passionate interest in photography has really kicked in.